Palmitoylation is a reversible PTM that regulates protein cellular trafficking and compartmentalization. Addition of palmitate to cysteine residues on the amino acid chain modulates protein recruitment by preferentially locating them to cell membranes, both intracellular and extracellular. In this way, palmitoylation modifies cell signaling by dynamic regulation of protein movement into and out of intracellular organelles or the cell itself. Disorders of this PTM pathway have been associated with diseases such as Huntington disease, schizophrenia and various cancers. Detection of palmitoylation sites and quantification is difficult using mass spectrometry-based proteomics analyses, since the thioester bonds are unstable during sample preparation. Moreover, methods such as SILAC (stable isotope labeling of amino acids in culture), used to overcome this instability, are not applicable where primary cell cultures are under investigation. This therefore precludes proteomic analysis for developing personalized medicine strategies, one of the important areas in clinical biomarker discovery. Morrison et al. studied primary populations of human T cells collected from volunteers, comparing the results obtained in their workflow with those from cultured Jurkat cells, immortalized human T lymphocytes. The team pooled the samples collected from three healthy donors, then isolated CD4+ T cells using standard methods. Following donor sample preparation, protein extracts from the Jurkat and primary cells underwent the same processing. The researchers reduced endogenous disulfides using TCEP and blocked free thiols. They then cleaved the palmitoyl thioester bonds prior to biotinylation, using a streptavidin enrichment technique (ABE, acyl-biotin enrichment) to selectively purify the target under investigation. The scientists then separated the proteins obtained using sodium dodecyl polyacrylamide gel electrophoresis (SDS-PAGE), selecting targets for specific immunoblotting to confirm resulting data. Following a heavy/light water labeling strategy and in-gel trypsinization, Morrison et al. then analyzed the resulting palmitomes by nano-liquid chromatography tandem mass spectrometry (nanoLC-MS/MS) using an Ultimate 3000 nano LC system coupled with an Orbitrap Elite mass spectrometer (both Thermo Scientific). 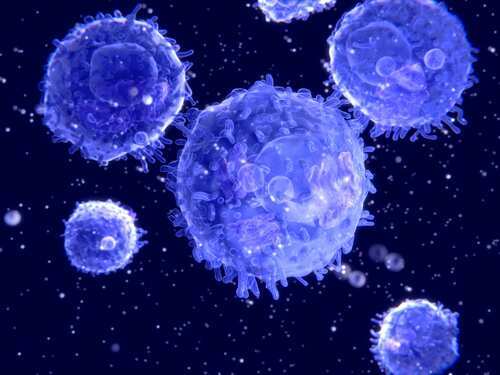 Following data analysis, the researchers selected only peptides and proteins with known expression within human T cells. They also eliminated proteins with known thioester bonds such as ubiquitin ligases that would represent false positives from further analysis. From this screening procedure, the research team identified 280 proteins in the primary human T cell palmitome, of which 92 are novel candidates. Compared to the Jurkat cell data, the palmitome for the primary T cells (n=280) is larger than that seen in the Jurkat cells (n=231), with 120 proteins common to both cell populations. The team confirmed their data with Western blotting. Morrison et al. assert that this workflow is a valuable contribution for characterizing palmitoylation in a number of primary cell types, expanding the proteomics tool set available for analysis of PTM regulation. 1. Morrison, E. et al. (2015) “Quantitative analysis of the human T cell palmitome,” Nature Scientific Reports 5:11598, doi: 10.1038/srep11598.